Hair color in the U.S. is quite common, and though most hair-care experts recommend that you have your hair professionally dyed, many people choose to do it at home. 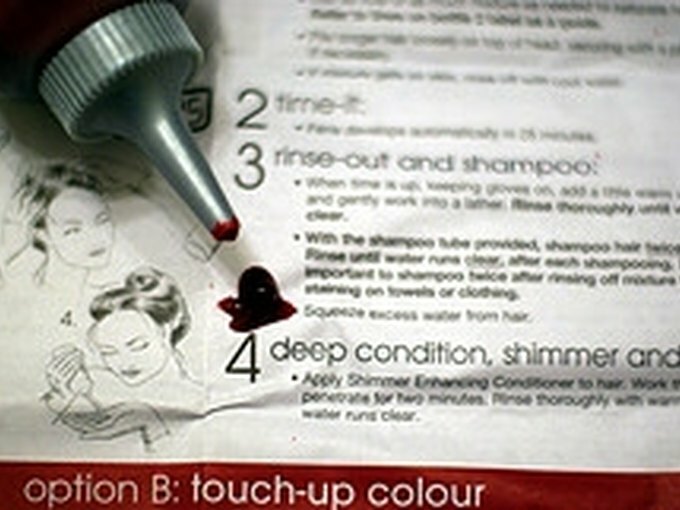 L'Oreal is one among many companies that offer several at-home dye kits. According to the U.S. Department of Health and Human Services, home kits are mostly similar in content. This article reviews the exact ingredients in L'Oreal Open Haircolor, Astral 10G, Golden Extra Light Brown. According to the U.S. Food and Drug Administration (FDA), there are both in-salon and at-home hair dye products. The products are generally classified by their level of permanence. Their strength ranges from a rinse, which easily washes out after one shampoo, to permanent, which cannot be washed out with shampoo. The hair dye bottle normally states what type of dye it is. The FDA stipulates that you should follow all of the instructions carefully. According to the U.S. Department of Health and Human Services' Household Products Database, L'Oreal's Open Haircolor has isoascorbic acid, polyglyceryl-4 oleyl ether, oleic acid, oleyl alcohol, phenyl methyl pyrazolone, sodium metabisulfite, fragrance/perfume, monoethanolamine (MEA), polyglyceryl-2 oleyl ether, resorcinol, water, trideceth-2 carboxamide MEA, pentasodium pentetate, 2-Amino-3-hydroxypyridine, ethanol/SD Alcohol 40, ammonium hydroxide, hexylene glycol, PEG-2 oleamine, ammonium acetate, sodium diethylaminopropyl cocoaspartamide, p-aminophenol and 2-methylresorcinol. These are all used in the colorant of the hair dye kit. According to the U.S. Department of Health and Human Services' Household Products Database, L'Oreal's Open Haircolor has propylene glycol, aloe barbadensis extract, spermaceti, trideceth-12, Chinese tea extract (camellia sinensis), cetrimonium chloride, amodimethicone, behentrimonium chloride, citric acid, chlorhexidine dihydrochloride, methylparaben, PEG-180, hydroxyethyl cellulose and propylene glycol. These are all used in the conditioner of the hair dye kit. According to the U.S. Department of Health and Human Services' Household Products Database, L'Oreal's Open Haircolor has hydrogen peroxide, glycerin, water, alcohols, C16-18, ethoxylated, sodium stannate, tetrasodium pyrophosphate (TSPP) and cetostearyl alcohol. These are all used in the developer of the hair dye kit. A study found that using hair dye can harm a baby if you are pregnant. This has not been proven, however. Another study looked at a link for hair dye and cancer, and results for that were inconclusive as well. According to the U.S. Food and Drug Administration, more realistic concerns with dying your hair are potential "hair loss, burning, redness, itchy or raw skin, swelling in the face and [and/or] possible trouble breathing."